Artech Courtyard is inspired by the time-honored courtyard – for the best of contemporary and traditional architecture to redefine living standards in a city. The project has spacious 2 BHK & 3 BHK apartments in various layout options. Located strategically at Ambalamukku, away from the hustle and bustle of the city, yet well connected by road to all the major centers in the city, Artech Courtyard is everything the Keralite home seeker has been looking for. Premium fixtures, value -added comfort & leisure amenities and a unique courtyard style planning that allows every home to have a view of the central courtyard. RCC frame structure with brickwork and or concrete block partitions. [ All plumbing services passes through the walls are solid block]. Concrete grade and Steel grade as perstructural consultant’s advice. Lift lobby and fascia wall & floor using composite marble/ vitrified Tiles, as per the architect’s design. Foyer/Living/ Dining/ Bed Rooms/ Kitchen using 60cm*60cm Vitrified tiles. Toilets: Ceramic tile concepts 30cm* 30cm for floor and 30cm*45cm for walls upto 4’6″ height and 2′ abopve the kitchen and work area counter. Balconies/ Open Terraces/ Decks: Rustic/antiskid/ ceramic tiles 30cm*30cm with MS railings. SANITARY FITTINGS: EWC wall-hung, concealed cisterns GERBIT/ GROHE make, counter washbasin. All sanitary fittings shall be of Roca/ American Standard or equivalent. Master Bed Room Faucets: Shall be single lever concealed diverters CP finish, heavy body metal fittings of Grohe/ Roca or equivalent make. Provision for hot water connection shall be provided for overhead shower in each bathroom. Health faucet also shall be provided. Other toilets: Shall be 3 in 1 mixer CP finish, Overhead shower, health faucetby Jaguar/ Roca/Grohe or equivalent. Kitchen & Service area: Wall mounted Faucets/ taps using JAGUAR or equivalent shall be provided. Stainless Steel Sink single bowl with drain board of make NIRALI or equivalent shall be provided for the utility and service areas. Towels rods, towel ring, soap dish and health faucets shall be provided inside the toilets. Window shutters: Prefabricated colour anodised aluminium. Door Frames: Main door frame and shutter shall be of seasoned teak wood. Inner and outer face to be PU coated and finished. Door Shutters: All internal door frames shall be of seasoned hard wood with flush/ Masonite Skin door shutter. All internal and external faces shall be malamine finish. Hardware: All hardware shall be in C.P Brass, tower bolts, doorstoppers, ball bearing hinges. Locks shall be mortise of Dorset/ Yale make or equivalent. Concealed copper wiring using Finolex or equivalent make with modular plate switches, centralized cabling system for all electrical and communication requirements. Wiring shall be done for lighting, 5Amps, 15Amps and AC points in the apartment. Switches: All switches shall be Honeywell/ Legrand/ Schneider or equvalent make. Generator:Power backup will be provided for all common services and selected light and fan point in each living, bedrooms inside apartment and a refrigerator point except Air-conditioning and Geyser points. Premium Emulsion paint shall be applied for the ceiling in the apartments. Internal Walls: Acrylic/ cement based Putty with Premium emulsion paint. External Walls: Weather sheild/ Equivalent exterior grade emulsion/ Texture paint. Provision for Split AC’s,shall be provided for the master bed. Access control entry to the common entrance/ foyers and gymnasium. Terrace gardens and wall designed Landscape area. Interlock Pavers or Tiles to be laid in driveways and walkways. Water bodies and fountains shall be provided as per the architects design. Plumbing work -duct lines100% to be completed. Plumbing work -(internal lines)100% ,duct lines(90%)completed. Plumbing work -duct lines 100% to be completed. Plumbing work -(internal lines)100% ,duct lines(80%) completed. Plumbing work -duct lines(75%)100% to be completed. Plumbing work -(internal lines)100% ,duct lines(75%)completed. Plumbing work -85% to be completed. Water Proofing work – 7th floor & 8th floor -100% completed. The following work are expected to be completed by next month. Piling work – 40nos – out of 182. Ambalamukku locality is one of the best residential zones in Trivandrum, the throbbing capital city of Kerala. This locality is well-connected to the rest of the city with good major roads that help cut down on travelling time. Ambalamukku lies between the Peroorkada junction and Kowdiar and is just about 3km away from Vellayambalam. 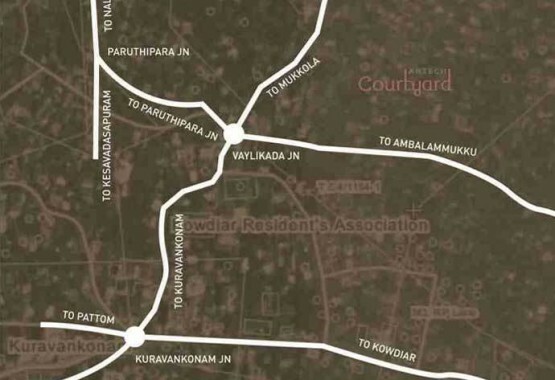 It is also a mere 8km away from the Trivandrum Central Railway Station and the Central Bus Station. The Trivandrum International Airport is also a breezy 12km away. Located on a rise, this locality offers panoramic views of the neighboring areas with vistas of a green canopy of swaying palms that add a magical touch to living in Ambalamukku. The best part about living here however, is its easy accessibility of the city center, yet far enough to escape from the traffic snarls and hustle bustle of the central areas. Buying apartments in Ambalamukku affords you a peaceful location that is free from pollution, yet very well within Trivandrum’s city limits. With high-rises being the norm these days for working parents, as apartments afford 24x7 security for their families, most people are heading towards buying 2 and 3BHK apartments in Ambalamukku. However, since homes are meant to last you a lifetime and you don’t really want to get in the web of fraudulent builders, your best option is to go with premium builders like Artech Realtors who have been in the business long enough to offer you some of their best flats in Ambalamukku.